Despite what you might read in Minnesota Monthly, not only is there plenty of jazz in the Twin Cities, but it is not all that hard to find. If you know the right source! Every jazz scene, like other arts scenes, needs someone to be the “go-to” for up-to-date information. In some areas there’s a local jazz society that manages this function. But it’s really hard to find volunteers to take charge and maintain the effort over time. Our Twin Cities Jazz Society maintains a website, but the calendar is at the mercy of “spare time” –which no one has. The Jazz Police website maintained a calendar for several years, but again, there’s no fulltime websmaster to handle calendar updates as well as manage the rest of the site. In the Twin Cities, writer/jazz "hound"/knitter of “hats for cats” Pamela Espeland has stepped in where few dared to tred, and has amassed as complete a listing of area jazz as humanly possible, which she maintains on her otherwise always-interesting and mostly jazz blog at Bebopified (http://www.bebopified.blogspot.com/). It has several view options so you can see the month or the full list for a given day. She might miss a few gigs but I’d be hard pressed to figure out what. Maybe something underground. The Jazz Society would be wise to link to Bebopified! If you would rather just hear about what’s coming each week, you can read Pamela’s weekly column in Arts Arena on MinnPost (http://www.minnpost.com/), usually featuring an interview with someone doing something cool in the local or national jazz world, or catch Pamela chatting for a few minutes with Ed Jones on KBEM radio, every Friday morning at 8:30. (If you know Pamela, you know this early hour is a real sacrifice for the jazz community!) And once per month on KFAI (the last Thursday, usually), you can catch Pamela with Janice Ewart on The Jazz Eye, Janice’s weekly broadcast (Thursdays at 10:30 pm). Usually there is some theme to the music, an interview, and always some fun commentary. So why is there a photo of a dachshund here instead of one of Pamela? Cuz she really hates having her photo taken and really loves Carmen. 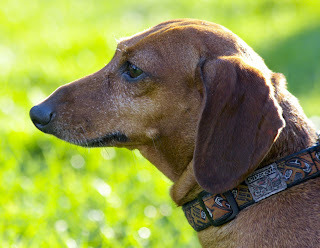 Carmen is a true jazz hound – she has been to many outdoor gigs and walks with a true swing feel.